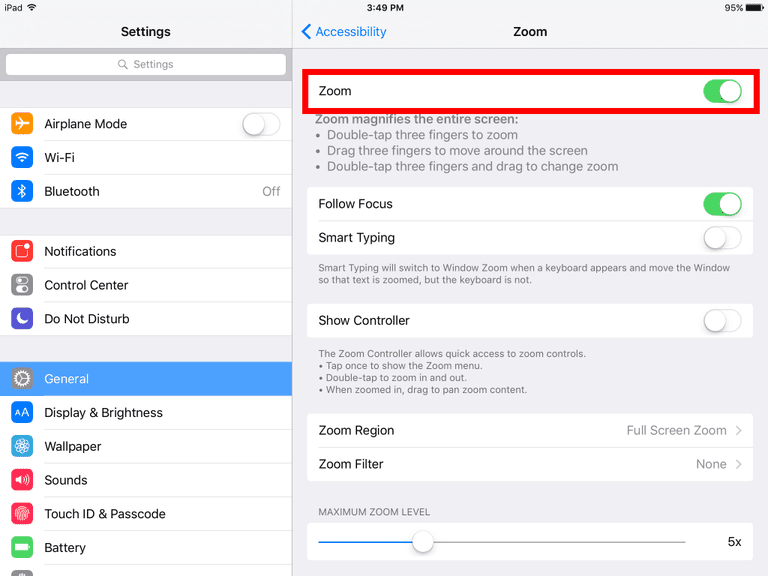 The iPad's accessibility features include the ability to zoom into the iPad's screen for those with poor or failing vision. It can also display a movable magnifying glass that can help those with poor vision read small text. Unfortunately, it can also cause some confusion for those who accidentally trip this feature on without meaning to do so. Luckily, it is easy to configure the iPad to keep this feature disabled for those who do not need it. First, we need to go into the iPad's Settings. If you are unfamiliar with getting into the iPad's settings, you can do so by tapping the Gear Icon. It's a good idea to make sure this icon is on your iPad's dock if you haven't already done so. Next, choose the General settings. This about midway down the screen just under Picture Frame. In the General settings, you'll need to scroll down a little bit until you see Accessibility near the bottom. Tapping it will give you the different accessibility settings. One common way people accidentally engage the zoom feature is by triple-clicking the home button. You can configure and/or turn off the triple-click within the accessibility settings by scrolling to the bottom of the settings and tapping Accessibility Shortcut. This screen will present a number of options for the triple-click. Tap the feature with a check mark next to it to turn off the Accessibility Shortcut.